Bacteriophages (natural antibacterials) are alternatives to antibiotics that can treat and prevent bacterial infections in animals. While they can be effective, delivery and storage of phage products is problematic. The Fixed Phage technology lets phages be delivered in a number of unique, cost effective and efficient ways. Most notably, phages can be immobilised (irreversibly attached) directly to animal feed. This feed can be stored for over a year at high ambient temperatures and delivers the treatment to the animals with no additional steps required by the farmer. This method of delivery is particularly applicable in aquaculture, where it allows the treatment to be concentrated in the target animal, so that whole ponds do not need to be treated. Fixed Phage Ltd is currently collaborating with a major multinational in this area. It is also contracted by the Flavophage Blue Baltic consortium, to use its immobilisation technology to enhance specific products to treat diseases of aquaculture in Finland and Denmark. This international and multi-disciplinary project will use the Fixed Phage technology to immobilise bacteriophage directly onto fish feed, to prevent bacterial infections in fish ponds. 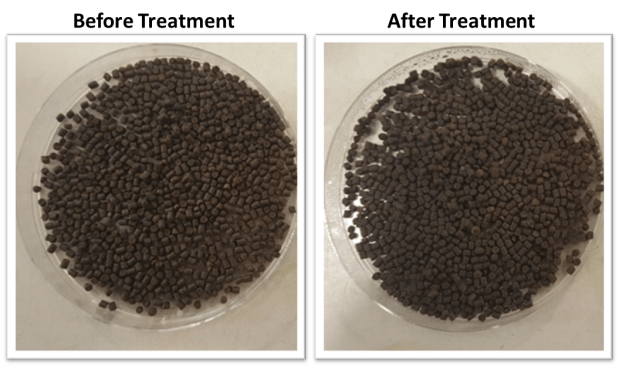 Compared to a free bacteriophage solution, bacteriophages immobilised on feed particles allow the targeted deployment to fish with increased efficacy, improved stability and a resulting lower cost of treatment. Most notably, at high ambient temperatures, phages immobilised onto feed have greatly extended shelf life when compared to phages which have not been treated with the FP technology. See Figure 1 for typical results. Figure 1: Stability of free (dotted lines) compared to immobilised (solid lines) phages applied to fish feed. Note especially the difference in stability at 30°C (red lines). In small scale tank trials performed in-house, fish feed with phages attached has been used to protect crustacea against challenge. Figure 2 summarises some of these results. Figure 2: Effectiveness of immobilised phages at preventing lethal infection in crustacea. Animals were given feed that was treated with immobilised phages or that was untreated. In the control group, all animals either died or became very ill over the course of the experiment, while phage treated animals were almost completely protected. Flavobacteria spp. are pathogens of fish, infecting both fry and adults. Infected fish present with skin lesions, fin erosion and gill necrosis with mortality rates of up to 50%. The can spread rapidly in the pond environment and is the cause of great economic and ecological loss worldwide . Current therapies used to treat flavobacteria include antimicrobials such as antibiotics. While research into vaccine development has also taken place, no vaccines are currently on the market [2,3]. Bacteriophage therapy has been tested as an alternative to traditional control methods. It has the advantage of only targeting specific bacteria, which avoids disruption of the normal flora required for a healthy pond environment. Several bacteriophages have been isolated targeting Flavobacterium spp. and these can treat flavobacterial infections in controlled settings . Commercially, the difficulty is in ensuring stability of the phages on the feed, and enabling a practically useful shelf life. As part of the Blue Baltic FLAVOPHAGE project, a purified, chemical free, bacteriophage solution targeting Flavobacterium was immobilised onto small trout feed pellets after surface treatment using Corona Discharge. Corona Discharge surface treatment removes the need for the addition of chemicals and result in the irreversible immobilisation of bacteriophage with minimal moisture addition and no change in feed palatability or appearance. Figure 3: Treatment of feed with bacteriophage results in no significant change in appearance or moisture content. Bacteriophages immobilised onto fish feed show increased resistance to environmental stressors including fluctuations in temperature, exposure to UV light and different environmental pH which allows for effective deployment in the aquatic environment as well as removing the requirement for a cold chain. These features, combined with the specificity of all bacteriophages, only target the pathogenic bacteria whilst leaving the beneficial flora untouched in the environment. Bacteriophage immobilised onto trout feed stored at room temperature have displayed continuous activity against Flavobacterium for 3 months at ambient room temperature with studies ongoing. The Fixed-Phage technology can overcome a number of issues that have been previously highlighted with bacteriophages and other treatment options and is a viable preventative measure against aquaculture bacterial disease. 1. Loch, T.P. and Faisal, M., 2015. Emerging flavobacterial infections in fish: A review. Journal of advanced research, 6(3), pp. 283-300. 2. Starliper, C.E., 2011. Bacterial coldwater disease of fishes caused by Flavobacterium psychrophilum. Journal of Advanced Research, 2(2), pp. 97-108. 3. Gómez, E., Méndez, J., Cascales, D. and Guijarro, J.A., 2014. Flavobacterium psychrophilum vaccine development: a difficult task. Microbial biotechnology, 7(5), pp. 414-423. 4. Christiansen, R.H., Dalsgaard, I., Middelboe, M., Lauritsen, A.H. and Madsen, L., 2014. Detection and Quantiﬁcation of Flavobacterium psychrophilum-Speciﬁc Bacteriophages In Vivo in Rainbow Trout upon Oral Administration: Implications for Disease Control in Aquaculture. 80 (24). Applied and Environmental Microbiology, pp. 7683–7693.